Now just to state that originally I had a list of 38 comedy films and then had to cut it down to just 10 films, so I know people will be asking why their favourite film isn’t on here and believe me it was hard to cut 28 of my favourite comedy films off the list. But the films on the list are the best of the best and deserve your laughs. 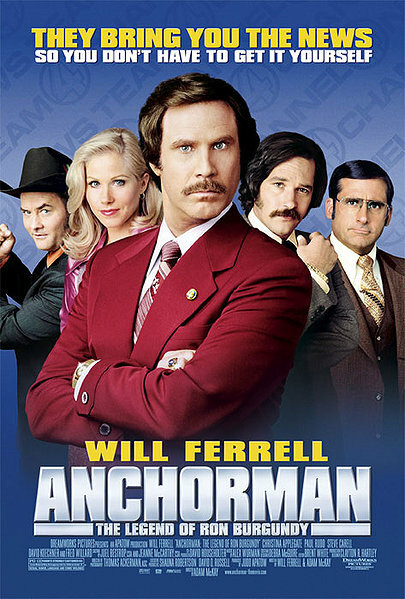 The winner voted by you for part 1 is Anchorman – The Legend of Ron Burgundy (2004) with a whopping 47.73% (21 votes) beating Old School (2003) by more than double the votes to my surprise, but I liked both of these films very much and I am glad they got the most votes. Clearly Anchorman destroyed the list on part 1 and I am glad it did, plus with Anchorman 2 Coming out 2013 everyone’s happy. So for the winner of the poll here is my write up and the whole poll results below. The winner voted by you for part 2 is The 40 Year Old Virgin (2005) with 31.48% (17 votes) beating the next three films which all drew at 18.52% (10 votes) this really did prove that part 2 had the votes deeply divided, but I liked that The 40 Year Old Virgin (2005) got the most votes and that this poll got the most votes in total yet (thanks everyone). So for the winner of the poll here is my write up and the whole poll results below. I missed the voting, but I would have gone with Anchorman and Hangover, though 40 year old virgin is a good choice. Is the next step to see which is better between Anchorman and 40 Year Old Virgin? I think that’s a harder choice than it first seems.